Designed to meet the exacting standards of professionals, the new P-ZT line of zero-turn mowers has a rugged 2- by 3-inch tube style frame and extreme-duty front caster assemblies. The fabricated cutting deck features twin 11-gauge steel sheet construction, which equates to a 1/4-inch-thick top deck area. 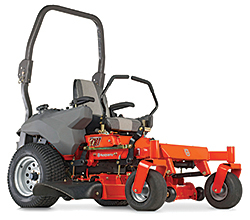 These mowers use commercial-duty, integrated ZT3400 transmissions with 12cc pumps, allowing smoother operation, speeds up to 10 mph and reduced potential for hose and fitting leaks.